Except for the doors that need to be pushed instead of pulled, don't all doors work this way? Standing in the doorway gazing out to sea, the ocean seems little phased by the night's rain. The waves are still capped by puffs of white foam. The beach at low tide still resembles a fast food lane for the birds. I wonder if the jelly fish are gone, but I can’t tell from this vantage point. I’m tempted to go down and put my feet in the water before I leave, but decide I better not chance frostbitten toes. For all it’s tumbling and churning, the ocean looks little different or worse for wear. I, on the other hand, feel lighter, more in control of my emotions, ready to go home. I’m having a debate with myself as to where to go to church, but if I don’t close this computer and get going, I’ll be late whatever I decide. Next time I run away (and I feel sure there will be a next time) I’ll work on being more decisive. And I think I’ll change that phrase. Instead of saying I want to run away, I’ll declare it’s time again to run towards something; and that something would be ME. I’ve been home for three days. Although Anderson suggested that it should be a gentle thing, my re-entry period was non-existent. I missed church, drove home, and hit the ground running; laundry had piled up, the dishwasher needed to be emptied and refilled, etc. etc. etc. I had the makings of a pretty intense head cold. My father seemed to need assurance that his investment had paid off. My Sweetie, God bless him, tried to be interested in me even though his mind was really wrapped around the fact that his daughter-in-law was about to undergo brain surgery. The dog welcomed me by wagging her tail and jumping back on the couch with her bone. On any other day I might have turned my suitcase on wheels around and headed back to my haven by the sea. But, here’s the good news. I didn’t want to go. I like that – soul moments. My short time away was full of them. Healing rocks, singing bowls, encouraging strangers, rhythmic waves, letting go, laughing children, rain on the roof, chocolate snacks, hot showers, coming home and feeling renewed. A girl can’t ask for more than that. I encourage anyone who might be reading this and can relate to some of the same feelings to read Joan Anderson’s books, then seriously consider some time away. You don’t have to go far, just far enough to have a different vantage point. I wish for you the same thing I found … peace. One of the things that’s tied me down lately is the day in/day out routine of fixing meals. I know that’s what I signed on for when I agreed to be Dad’s caregiver. I know that’s part of the job description that goes along with the position of Kitchen Maven. I know that I told Jack I like cooking. And all that is true. But it gets so tedious. Cook, eat, clean. Cook, eat, clean. Go out, eat, and so on. Left on my own, I think I might be more like a cat. I’d snooze most of the day, eat when the mood struck, clean myself regularly (in my case this would involve a long hot shower rather than that intricate licking process) then I’d do it all again. It, too, might get old after awhile, but it sounds like the life of Riley when you’re worn out, stressed out and burned out. After giving myself permission to take some time off, I decided to break a few more rules. I wondered around Target without regard for time. The irony was not lost on me that this was the weekend that the battery on my $14.95-pawn-shop-watch that has “kept on ticking” without fail for three years decided to quit. I lost all track of time and I believe this was part of the Divine plan. I did a lot of sleeping and some not very good eating! I had a Butterfinger for dinner! How bad is that?! I could feel a cold coming on, so I stopped by the drug store and stocked up on fluids and antihistamines. Once back in my room, I donned my flannel PJs and climbed into bed. Ahhhhh! I watched a little TV, read some and fell into a peaceful sleep. I awoke around 9:30pm with rain dripping onto the balcony chairs sounding like a Chinese water torture. I checked and the rain didn’t seem to be blowing in the room so I left the door open. As with the letting go exercise on the beach, when I was finished, I was finished. Unlike physical exercise, I needed no cool down period. I put the pen down, snuggled under the covers and snoozed some more. A good dose of Nyquil and candy bar will do that for you, but so will the release of emotional baggage that’s gotten way too heavy to carry. I got up a few more times to watch the ocean and listen to the rain. What could have seemed like an overdose of Mother Nature was really just the elixir I needed. I read a little, wrote a little then wondered what to do with myself. I succumbed to the TV screen and the implication of control by not having to share the remote. I could surf through channels, if I wanted to, or keep it on some sappy Lifetime drama. I passed quickly by anything that looked remotely scary – Cops, crime scene shows or CNN news. I ended up watching most of a documentary of how Oprah traced her African roots through genealogical research and DNA. You’ve come a long way baby, and I mean that in only the kindest, most admiring of ways. At any point in her life, or the lives of her ancestors, had a different choice been made, the story would have had a different ending. I think that must be true for all of us. And since I’m doing some introspection, I think it is a good thing to realize that the decisions and choices I’ve made in the course of my life may have been right or may have been wrong, but they shaped the person I am today. I fell asleep pretty easily, the door still open and the surf still pounding. All was quiet on the Eastern front until the wee hours of the morning when it sounded like a platoon of Worldwide Wrestling Federation hopefuls began practicing their moves in the room next to me. The shock waves through the wall and into my bed were not the same peaceful vibrations as from the singing Tibetan bowls. Mercifully it didn’t last long, or I found a way to sleep through it. I awoke to the sun and surf and very real call of nature. Once out of bed, I peeked out the window and saw that the tide was out. It seemed to be calling me to begin the part of this journey of which I was most afraid - to walk the coastline of the land as well as that of my heart and see where it would lead. I was using Joan Anderson’s, A Weekend to Change Your Life as a rough guide. Part of her program is to get physical. It’s been awhile since I’ve been physical, yet the wide open beach looked like a perfect place to begin. In contrast, my emotions seemed almost too buried to get in touch with. Getting physical in an emotional sense was less inviting. Before starting my walk, I wrote down the things that have been bothering me recently. In a random stream of consciousness style, I wrote the words - ANGER, FEAR, RESENTMENT, to name but a few. I repeated them over and over again until I was pretty sure those were all things that needed to be deleted from my life, adding to the list as the emotions came to the surface. On the opposite side of the paper, I wrote a prayer asking that God take away my pain and replace it with joy and peace. Armed with a few talismans, my camera, a bottle of tea, and the note I set out. I hadn’t gone far when I realized I had crumpled the piece of paper into a tight ball and was holding on to it with all my might. Interesting. I headed straight for the water’s edge and couldn’t ignore the hundreds beached jelly fish bodies strewn from sea to shore. Looking as if they had been spit out in the ocean’s equivalent of vomit, red blobs of gelatinous fish matter littered the beach as far as the eye could see. It wasn’t the prettiest of views, and it was a little stinky in spots, but there was plenty of beach to go around. The sea gulls didn’t seem to mind. In fact, some were treating themselves to a jelly fish smorgasbord. I couldn’t help but wonder if jelly fish contain venom to sting its prey or unsuspecting swimmers, why doesn’t that same venom hurt the bird who is eating it? I decided in my simplistic way that sea gulls are probably no different than humans. We often eat things that we know are going to hurt us, like cholesterol-laden prime rib or calorie-stacked-triple-chocolate layer cake. Even knowing the eating won’t be good for our bodies, we do it anyway. The key, I think is to do it in moderation, and let’s face it, sea gulls are probably not binge eaters. My mind was on the fast track, probably trying all it could to keep me from the task at hand. I laughed at the metaphor presented by all the jelly fish. Clearly, the universe was in agreement that whatever has been keeping me bound up needs to be released. As I walked I picked up a shell or two and it brought back memories of a recent beachcombing trip with my sister. Clearly I was not alone on this journey. The divine puppeteer was holding the strings of my heart and mind; it was my job to let the scene unfold. So I walked, remembered, picked up shells, wondered about the jelly fish, laughed at little birds bathing in the surf, and clung to my pocketed paper. Gradually, my tension eased. I felt myself begin to settle down. I challenged myself to find a spot where there were no more jellyfish. This would be the place to toss my paper into the ocean. (Okay, maybe I wasn’t quite ready to let go; clearly there wasn’t going to be a jelly fish free zone for miles.) Since I already felt like I’d walked halfway to Amelia Island, I started looking for an area that had less blobs than the rest of the beach. Finally I settled on a place that looked as good as any other. It was time. I took my shoes off. I went to the ocean’s edge, then prayed for help and blessing. I began to shred my paper into tiny bits. With each tear, I loosened the emotion attached to the words on the paper, and urged it to fly free. It was hard at first but it got easier. Partly because the time was right and partly because the water was pretty darn cold and my feet were freezing. I stood, there, however, until the paper was out of my hands, released to the sea, as if it was some kind of watery recycle machine. I know I’m not the first, and I doubt I’ll be the last person to give my pain and sadness and anger and fear, etc, to the mighty ocean. Gratefully, it’s big enough to take it. As I walked away, feeling noticeably lighter, I looked into the surf and saw that little bits of paper were following me. At first it was hard to tell the difference between the paper and little white drops of bird poop, but the lines on the paper were still visible so I knew it was my own poop not a gull’s. I couldn’t help but chuckle as I picked up each returning piece of paper that didn’t want to leave my side. I kept tossing them back into the water, however, until they were indeed gone for good, churned and consumed by the waves. Then I headed back to the motel. I kept no particular pace - was in no particular hurry. I felt as if I had rounded a corner. I was aware of wanting to write about my experience, but realized that even though journaling is a part of the experience, by thinking ahead to what I might write was taking me out of the moment. I need to learn to live in the moment - not in my history and not in my future. The here and now is what is important. I miss too much otherwise. I am a little surprised that I did all this tossing away without tears. I expected to do a lot of crying. Perhaps I’ve already cried all the tears I have. Maybe the ocean provided the salt water baptism needed for my renewal; or maybe I’ll cry later. Whatever the case I walked away dry eyed. Wondering what might come next, I heard the sound of little girls laughing. Has a prettier s ong ever been sung? If Beethoven had not been deaf, I think he would have written Ode to Joy after hearing a group of 10-year old girls, unfettered by self-doubt and self-consciousness, laughing and dancing at the ocean’s door. My inner child laughed with them, and my grown-up girl did too. I don’t know what those girls were doing out there. I’d seen them huddled in a group earlier. Clearly they’d been given the go ahead to have some fun. Wanting to capture the moment, I asked one of the chaperones if I could take a picture. So he wouldn’t think I’m some kind of weirdo, I explained that I was on a personal retreat and the sound of the girls filled my heart with joy. He seemed to understand, and nodded a go ahead. I stood back, watched, listened, snapped a few photos and smiled, really smiled for the first time in weeks. I left the house about six hours ago but my retreat didn’t officially start till 3:00p.m.when I checked in. So I’ve been on my own for a little over four hours. Well, not really on my own, as I went back to the place where I got my healing rocks and had a Tibetan Singing Bowl massage. It sounds weird, and the girl suggesting I try it agreed it was a little weird at first. According to her, the two things it had in its favor over traditional massage were #1 you don’t have to get undressed and #2 a stranger is not rubbing oil all over you. I would add my own #3 that it was cheaper than the other massaging choices and #4 the man who does the bowl treatment was on call and was taking late afternoon appointments. I had no idea what I was getting in to, but since this weekend is an experiment in inner healing, I decided it couldn’t hurt. Jeff was not at all what I expected. Not that I knew what to expect, but I had visions of a bald guy in an orange sheet, or someone left over from the 60’s - long gray hair, tie-dyed shirt, flip flops and congenial in that laid back groovy kind of way. (Not that there is anything wrong with that!) It was the reference to Tibet that through me off. Jeff was just an average guy, with a desire to help people vibrate themselves into alignment. He directed me to lie on to the massage table, pulled my arms and legs till they wouldn’t stretch any more, had me do some deep breathing while he pounded on my clavicle then told me to roll over to start the massage. Tibetan singing bowls are (no longer made in Tibet but India for reasons I’m not sure of but might have to do with politics) made of 14 metals, one of which is an old bowl that can’t be used anymore. Jeff didn’t explain why an old bowl can’t be used, but maybe it’s because of cracks or something. However, I like the recycle-ness about using the old metal in the new. Jeff placed three different sized bowls on my back - near my feet, just over my rump and in the middle of my chest. I don’t know what size when where but I could tell the one on my chest was the heavier of the three. It had a deeper, more gongy tone to it when struck with the Tibetan singing bowl felt mallet. The sounds are hard to describe. Each bowl definitely had a different tonal range, and they all vibrated to a different degree (Papa Bowl, Mama Bowl and Baby Bowl vibrations). Like hitting a tuning fork, or throwing a pebble in a pond, the ripples go out of the bowl, and since the bowl was sitting on my back the vibrations connected with my body’s natural vibrations and kind echoed? When Jeff was near my head, I could feel (hear) the vibrations in my ears. The song the bowls sang was a bit like organ music in the way it vibrated. You know how a steeple bell sounds when it’s calling you to worship – DONG-G-G-G-g-g-g-g? Can you imagine feeling that as well as hearing it? I never fell asleep. I was always aware of sounds just outside the room. But I was also kind of in a Tibetan bowl trance so that I didn’t want it to end. After the last tinkling of what sounded like little angel wings, Jeff whispered to me to take my time getting up and that’s what I did. I was surprised to find that when I sat up, my head was still vibrating; I felt a little dizzy but definitely relaxed ...and hungry. The only problem I can see with this kind of massage therapy is a personal one. I found that the vibrations loosened a few of what I hoped would be tiny little poots. It would have ruined the ambience if I had “let one rip” (as the nurse described Dad’s first trip to the bathroom after his ill-fated colonoscopy) so I was a little on edge about that. As I was leaving, my new friend Bella, told me to have a good retreat. “I’ll try,” I responded as I vibrated towards the door. Then I stopped, and corrected myself, “I will” I said with assurance I hadn’t felt all day. “Thank you,” she replied as if my assurance somehow made her feel better. Bella is a cancer survivor and I think she connects to people on a different level than I am used to. I liked her a lot. A little after three in the afternoon. Well, here I sit, by myself in the Best Western Motel at the beach. I whined and cried and growled enough for the last week that everyone decided it was time for me to have a break. I feel a bit of a decadent thrill coming on, mixed with a degree or two of guilt, a pinch of sadness and a giant scoop of loneliness. I’ve only been here for 10 minutes. Upon arrival, like any little kid who needs to check out her new surroundings, I peed. (Okay, Carolyn, settle down.) Then I opened the door and turned off the AC. I set up an altar of things I brought with me. On the way to the motel I stopped at a store I’d seen advertised last week. Peaceful Journey, how’s that for a name? Is it coincidence that it’s only a few blocks shy of where I’m staying? Before I even crossed the threshold, the aromatherapy was working. I loved the store from the get go. Good smells, good tschotchkes, good karma. When asked “how I was,” I uncharacteristically answered honestly by saying, “in transition – maybe a little scared.” I wandered around the small store but zeroed in on some stones that seemed to speak to me and had the right healing energy for my weekend. Funny, I wasn’t even aware that rocks had healing energy but I was drawn to them. It became clear to me that this time away was going to be a learning experience. And finally, I picked Blue Kyanite. It connects you with youthful zest and optimism. It encourages you to speak from the heart with trust and experience the joy of life. It is used in meditation with calming, clearing effects, as a gentle guide. It is a 5th and 6th charka healer due to its assistance in communication and foresight in solving issues. I also made an appointment for a Tibetan Bowl massage. I know it sounds kind of woo-woo but the clerk, Bella, said I wouldn't have to take my clothes off and it would be perfect for to help me get centered for the weekend. Bring those bowls on! I’m wondering if I should close up my computer as it is a link of sorts with the outside world. Or should I keep writing as it is my form of journaling. I think that’s kind of an excuse not to be alone with my thoughts right now, so I’ll just write a little more then enter the silence. My reading matter of choice for the last year or so has been various books with the “retreat from the world and get to know yourself” theme. The author(s) go off to some rural setting (usually an old farmhouse in New England), reconnect with nature, bond with livestock of some kind, find meaning in every day experiences that seem more profound than their daily tasks in the “real world,” then, to top it all off, write and publish a book about their insights. In The Dogs of Bedlam Farm, John Katz bought sheep so he could train his border collie. In Fifty Acres and a Poodle, Jeanne Marie Laskas writes of her (mis)adventures living with, among other things, a Standard poodle and a donkey. Joan Anderson swam naked with seals off the coast of Cape Cod; Sy Montgomery raised a gigantic pig named Christopher Hogsworth; and Catherine Goldhammer fell in with a brood of chickens. Even though there are vast differences in the authors’ reasons for the change of landscape (both inward and outward), the writing is always good, the animals loveable, and the desire to write about the experience an inspiration to me. I think, although no one has really ever told me this, that in order to get through a midlife crisis, one needs to step out of the daily grind, get in touch with some form of nature to renew one’s spiritual connection, share the experience with at least one non-human, and take good notes. So here I am ready to put question to the test. I have no livestock with me but I’ve already been moved by the site of a chubby brown puppy and picked up the sound of sea birds outside my balcony. For now that seems to be enough. I understand that humans are a more refined species than say, cats or dogs. We walk upright; we shake hands instead of sniff bottoms; we eat food that has been cooked and made to look pretty; we walk around, instead of roll in, really stinky stuff, and we, for the most part, don't like to throw up. Still, I can't for the life of me understand why a 16 year old cat who's main objective in life is to eat and sleep, and who can no longer leap tall buidlings or make it to the top of a table without a lot of head bobbing and a good dose of "I think I can" will attempt to climb the cat equivalent of Mt. Everest just to nibble on a house plant that he knows is going to act as an instant emetic. He risks life and limb for a green treat that immediately comes right back up. What's that' all about? Recently I brought in a plant that had been residing outside and needed some TLC. I trimmed off the brown parts, replanted it into a perky little pot, gave it a good drink of water, then set it in the living room in a fit of feng shui. Not that I even know what that is, except that I think it has to do with adding an earthy element to one's home. This plant seemed to fit the bill. I'm aware of the cat's desire for things green, so I did this shui-ing behind his back. I thought to myself how often does the cat even go in the living room? Unless he's out to torment the dog by getting within a whisker's breath of the rawhide bone residing in the middle of the carpet, the cat usually takes another route to and from the litter box. However, acting as if he might take a chomp out of something so totally a dog's domain is not out of the realm of this particular feline's cat-itude. As I placed the plant on top of the CD chest, I smugly told myself that he would never even know it was there. Wrong! The next day I was enjoying a rare quiet moment, when in strolled the gray one. He stopped right in front of me, as if he didn't want me to miss a thing. He then proceeded to retch in a very catlike way; not a quiet, hard to notice, petite regurgiation, but a full-fledged, stomach-turning-inside-out gagging with the sound effects of a Steven Spielberg movie. Eventually, the plant matter was up and out and sitting in a glob of mucous at my feet. The cat looked at me like he'd just coughed up a golden egg. Quite proud of himself, he waited for me to deliver what he considered was much deserved applause, then turned and walked away leaving the prize puke for me to deal with. Cats ... you got to love 'em. P.S. You can tell by the nubby remains of the plant stems in the photo, that this was not a one time occurance. "No one is able to enjoy such feast than the one who throws a party in his own mind." I read a newspaper article recently in which the much younger and hipper columnist described the transformation of the seemingly innocent "Hello Kitty" diary of bygone days to the tell-all-no-holds-barred-secrets-be-damned MySpace blog of today. Capitano describes information revealed by today's teens that, quite frankly, shocks me. "Our reckless youth are comfortable with their lives being an open book," she wrote. * She calls these bloggers egocentric. So I started wondering. Even if my postings pale in comparison, does the fact that I have started my own blog and feel free to post my thoughts for all the world to see mean I am egocentric? If it does, is there something wrong with being egocentric? I have never been very good at journaling. If I got a diary for Christmas, I waited to write my first entry until January 1 of the new year. Then I promised myself (and the diary, as in "Dear Diary," like it was an all knowing, all caring, all understanding invisible friend) I would be faithful in my daily entries. As with most New Year's resolutions, this promise wasn't kept for very long. When I was in high school my English teacher required us to keep a journal and turn it in for a grade ... not on the content but on the writing discipline itself. This coincided with my first bout of clinical depression, so I undoubtedly had a lot to write about. But even then, I wasn't very good at daily entries; I usually filled in the empty spaces the day before the journal was to be turned in. On my list of favorite things, a good journal would probably make the top ten. Whether it is an ordinary black and white speckled composition book, or a leather bound journal that you know you're going to keep forever, I love the feel and look and variety of the journals on the market today. I like writing in pen or pencil or colored marker. I like scribbling in a quick cursive scrawl, and I like taking my time by carefully printing each word. Over the years, I've started a number of journals. Mostly I've written about depression and dreams and woe-is-me stuff. I keep stylish notebooks stuffed with quotes and articles and things I want to remember, as well as journals filled with favorite passages from books I've read. I actually believe that one day I will organize them all into a book so my heirs will have a picture of me long after I am gone. Not a photograph but a glimpse into what made me tick. Ahhhh, someday. Even though I have not been a disciplined writer, I have always enjoyed putting words together. I like the act of writing, of choosing the correct word, of painting a picture with syllables and syntax. Since it's easier for me to write than to speak my mind, I like having people tell me they like what I have to say. As I've gotten older, and a little more sure of myself, I've gotten better about writing for the public (my family and friends) rather than for myself alone. I've even taken a few college writing classes and put myself, in the form of my writing, out there for scrutiny. The results have been positive enough to start this blog; some of my fear of rejection has dissipated (some not all). I wonder, however, why people write? For themselves or others? Like that old question about a tree falling in the woods with no one to hear it will it still make a sound, if a writer writes something and no one reads it, do they still have something to say? If I post something everyday on my blog and don't tell anyone I even have a blog, is there a point to it? If I do tell people, "hey, guess what, I've got a blog and here's how you can get there," am I letting my ego get the best of me? I am blessed to have some pretty good cheerleaders - my daugher, my dad, my aunt, and my true love (Okay, so the prejudice factor is kind of on the high side, but that doesn't get in their way of honest encouragement! )My sister is perhaps one of the best cheerleaders a writer could have. Actually she's a damn good cheerleader in general. But since I write, she encourages that. She sends me writing style books. She sends me articles about writing. She says things like "you can do it," with such enthusiasm, that it's hard not to think I can. I received two articles yesterday that speak to the subject of writing. It seems to me that if one has the gift to put words together, they write. If one can draw or paint or climb mountains, or sing, or dance, or ride elephants in the circus that's what they do. It's not so much about who they are (ego?) as what they are. Each of us has been given a gift. It is in the using of that gift that we enlarge, not just ourselves, but our world. Here's a good example of how my ego gets a tad bit carried away. Let's say I write something that I feel really good about. In my mind, I don't stop there. I begin to imagine myself demurely sitting on the same couch that Tom Cruise jumped all over across from Oprah as she tells me how much my words meant to her. My book is on her Book Club list (making it an automatic best seller)and all the audience members have a copy under their seats. Everyone in the room is anxious for the show to be over so they can go home and start reading. (Forget Oprah, this is all about ME!) I am able to accept accolades without throwing up, or deflecting every compliment that comes my way, like they are arrows to my heart rather than the warm fuzzies they are meant to be. I feel worthy. I'm glad I threw away that little diary key and opened up my thoughts for the world to see. I'm a little embarrassed to admit it, but the first thing I do every time I check on my blog is to see if anyone has commented. Even though my college professor told a story about his newspaper days when someone wrote in response to one of his articles that they hoped he would die(ouch! ), the puppy dog spirit in me needs a pat on the head. I don't know what I'll do if someone leaves a negative comment. So, you see, I have an ego that still needs taming like the teen bloggers Capitano writes about. I also have an imagination that, if left to its own devices, could take me on a magic carpet ride. But mostly, I'm the "Dear Diary" kind of writer - private, yet led by a muse that wants to be heard. *Laura Capitano,Jacksonville Times Union, January 14, 2007; The Last Word, Anna Quindlen, Newsweek, January 22, 2007; My Turn, Newsweek, Febrary 20, 2006. 1. The smell of a fresh cut pine tree: When I was vacuuming this morning, I realized that even though the 2006 Christmas tree is long gone, there was still a pile of fallen needles behind the table where it stood. I realize that by making this observation, then posting it on a blog that I am letting the world know my cleaning habits are subpar. Then again, the fact that I've only told three people about my blog and they love me despite the fact that I am house cleaning-challenged, I shouldn't have too much to worry about. My point, however, is not my cleaning habits or lack thereof, it is that even though it's been over a month since the tree was put up, lit up, decorated and dismantled, the trail of needles still smelled fresh. How cool is that? There seems to be some kind of phenomenon that happens when the vacuum picks up the neeldes, then swirls them around in its vacuum vacuum that re-energizes the pine molecules and sends the scent of piney woods through the room. It's a wonderful smell and brings back memories of Christmases past or walking through a verdant smelling forest. On a dreary January day with no holidays in sight, it's kind of like making your own pot pourri without the pot! Of course, this vacuum transformation of rug detritus to delightful smell also happens in reverse. Sometimes when one is vacuuming up a pile of dog hair the smell that comes floating out of the machine is that of a wet, stinky dog. This is when you know it's time to change the bag! 2. French socks: You know the T-shirts in every cheesy souvenir shop along the Atlantic coast, that say, "My Grandma (or mom, or dad or great Uncle Charlie) went to so and so and all I got was this T-shirt." I hate them. Not only is it a stupid saying (and I've got to wonder who would ever wear a shirt with it plastered on the front although obviously many people do? )it sounds downright ungrateful. It makes me want to smack the person wearing it, for whining instead of saying thank you. But then, if they are wearing the dang thing then maybe they are grateful and who am I to be smacking anybody? My point, is this. My daughter went to France and brought me home some socks. She brought some other cool stuff too, like a medal from Mont St. Michel, some Parisian rocks, and a children's book about a "Proofting" (that's French for pooting) French elephant which I dearly love and deeply appreciate. But I am particularly enamored with the striped socks. Like the nylon "Peds" I wore when I graduated from bobby socks and saddle shoes to Capezio flats before I was ready for a garter belt and real stockings, these socks are stretchy but don't go all the way up to your ankle, they stop just over your heel. The stripes are brown and turquoise and lime green and purple with a line of pale yellow thrown in the mix. Wendy has a fancy for the color brown. I hope I don't sound like a copy cat when I say the color is growing on me. Espicially when it's mixed up with bright colors like turquoise and purple. I like wearing French socks. It makes me feel kind of ... well, French. When I wear my French socks I feel like saying things like "ooh la la" or "oui oui mademoiselle." I have a little lilt in my step - kind of like a walk with a French accent. Let me suggest that when you go on vacation and want to take home a little gift or souvenir of the place you've been, you might want to consider a pair of socks. In my estimation they are a better example of a place than a bumper-sticker T-shirt. In fact, socks are "tre magnifique." 3. Slim Pens: On one of my last minute Christmas shopping trips I found myself in a craft store where something on every shelf cried out to my creative side which has been lying dormant for way too long. Being a woman on a mission and in a hurry, I resisted the urge to buy scrap book paper or beads for making jewelry. I walked right past the ceramic paints aisle and, even though I strolled down a rubber stamp strewn lane in complete amazement that there were so many stamps to be had, I basically picked out the picture frames I was looking for and checked out. This is was apparently my downfall. When the clerk handed me my sales slip to sign she also offered me this fun little pen, which felt right at home in my hand. I readily admit that I am a pen freak. In my opinion, few pens measure up to the Extra Fine Sharpie standard, but I can usually be swayed by a pretty color. This pen was slim and bright blue (sort of turquoisey) with a fine point. Who could ask for more? "What a cool pen," I remarked to the girl, risking a conversation that could hold up the line of weary shoppers behind me. "We have a bunch of them for sale, right behind that stack of journals," the clerk said with true salesmanship. I finished my purchase, then walked right over to the pens. To my delight there was a whole box of these little gems. Made by Marvy, they are called Le Pen (ooh la la!). I bought three - one blue, one olive and one violet. I left happy. It's the little things in life that often bring the most pleasure. 4. Cat Puke: Usually cat puke is not a great subject. However, when I did my aforementioned Friday run through the house with the vaccuum cleaner, I came across this little dollop of dried throw-up. It reminded me of my mom's cat. It made me stop and think about the feral cat who shared our home for ten years. True to her wild background, Baby was never a very friendly cat. Her instincts to growl and hiss and bite were not far removed from her saber tooth tiger ancestors. Even though Baby was a picky eater, when a can of Purina Oceanwhite Tuna was put in front of her she would guzzle it down then promptly throw it all up just like any true bulimic. When she didn't have food to throw up, Baby wasn't shy about hacking up a wet hair ball. Baby was also not the least bit bothered by when or where she vomited. It was not unusual to wake up in the wee hours of the morning to the sound of gagging. More times than I can remember she would make her deposits in the middle of of Dad's bed, or on the stack of papers on anyone's desk. Cat puke, I discovered the hard way, blends quite nicely into the pattern on our couch; it's hard to find til you sit in it. Nice! I can't honestly say I had warm feelings towards this cat. But once we discovered she had a growth in her stomach that made it just about impossible to keep anything down and that she wasn't throwing up just for the fun of watching me clean it up, it was easier to have some compassion for her. The only time I can remember holding her in my lap and petting her the way humans like to do to their pets, was after the vet had given her a merciful shot to end her vomitting forever. When he removed his stethoscope and gave me that silent nod that said more than words could say, I had to pray her next life would be throw-up free. 5. Saying goodnight: I was in a bit of a funk yesterday. It was kind of an anger hangover. While I'm easily ticked off by fast food lanes that are anything but fast and spending more time waiting to see a doctor than actually seeing him, or talking to a computerized telephone voice who is trying to sound all nice and courteous but is still a machine not a real person who can give you the information you want without a lot of questions, I like to think I have a fairly high anger tolerance - at least for the red hot anger that is more destructive to me than anything else. So I got mad, probably madder than I needed to be, but mad is mad and I haven't yet found the dimmer switch on my emotions. Then I had to live with it for a few hours, then I had to stuff it, then I had to deal with the pootiness of that. Thus the hangover. I am sure I wasn't a peach to live with. I'm also sure we all need time and space to process our emotions. It's hard to do in community. After dinner I took myself a long hot shower - the Valhalla of depression therapies. In doing so, I missed the opportunity to say goodnight to my father. The good news is that today is a new day. As I was serving Dad his morning prunes we smiled at each other. My smile was the sign we both needed to know I was feeling better. That's what is good about a smile, it can say, "goodnight, daddy, sleep well and good morning" all at the same time. As I was dishing out my Dad's breakfast serving of five (not four, not six) stewed prunes this morning, I decided that whoever is in charge of prune public relations must really have a hard job. I just don't think it's humanly possible to come up with an advertising campaign that could possible make eating something that looks so much like a round little poop ball appetizing, let alone more desireable than, say a banana or an apple or a kiwi (which in my opinion could use a haircut and a shave). I doubt that even dancing, Motown-impersonating, prunes could convince me with a hip, toe-tapping tune to taste this shriveled up fruit. I'm pretty sure concentrating on the packaging, would also have little effect on my decision to eat such an ugly thing. Easy open, zip-lock containers or citrus flavoring aren't going to change my first impression of something that looks like it came out of the toilet. I suspect there are prune lovers all over the world who might disagree with me. But let's face it, prunes are brown, and brown is just not a color that screams, "eat me." Unless, of course, it's the deep, rich, dark brown of Ghiradelli chocolate. I admit I have not yet gotten to the age where I look forward to debating the pros and cons of eating prunes with my doctor. The day might come when I have to eat these words as well as the frightfully poop-esque prune. So far, however, that particular part of my body works pretty much the way it's supposed to. I may have become more of a tooter than I once was, but someone told me I could blame that on menopause, (which is a pretty convenient excuse for just about any middle-aged malady) not the slowing down of my intestines. "May god bless you for your Gold Label Lemon Essence Prunes." "I must tell you I am in love with your new product - Plumsmart." "Thank you, thank you, thank you for your Sunsweet Pitted Prunes!" "I just loooove you're sunsweet prunes.. soo delicious." To my astonishment, the Sunkist website also has several prune recipes. I can't help but wonder if my generational peers will one day share their nursing home desserts with the same anticipatory gleam in their eyes that they had in the 60's when they passed around the "homemade" brownies. In my search for prune enlightenment I googled rather than gobbled. Up popped a site for prunella vulgaris. My curiosity was tweaked so I checked it out. In case you are ever on a TV gameshow or just need a subject to jump-start a lagging first-date conversation, Prunella Vulgaris is a chinese herb known as "self heal." The herb is full of anti-microbials and anti-oxidants, which I suppose is a good thing even though I'm not sure what it means. It is also showing promise in treatng herpes simplex. Not only that, it's fun to say ... prunella vulgaris, prunella vulgaris. Try it. Funny, that's exactly what my dad said to me this morning when I handed him his prunes. Near the St. Vincent's Medical Center in Jacksonville, there is a new park decorated with bronze statues depicting the Sisters of Charity who founded the center in 1916. The various poses signify the various aspects of the work the sisters did - the Dreamer, the Pray-er, the Breadmaker and the Planter. I think of those four, I'd probably be classified as a dreamer. I like to think of myself as an idea girl. Perhaps, before I tell you a particular success story, this would be a good time to point out that all my ideas are not what you'd call winners. Like the time I lit all those candles on the beautifully evergreen draped mantle just as my holiday guests were arriving. Who knew the flames would reach so high they would burn the fake (and obviously meltable plastic) moulding on the mirror hanging over the fireplace? And how was I supposed to know when I talked Wendy into driving eight hours through the night to get from San Diego to Tuscon for a hot air balloon festival 5 am take-off that a sand storm would kick up so much wind and dirt the balloons would be grounded. And I'll even admit now, after twenty years have gone by and tattoos are more the norm than the exception, that my giant-step-for-womankind-foray into independence was not one of my better decisions. Sometimes a girl just has to do what a girl has to do, but let's not go there. My most recent idea started off pretty benign. As in years past, as soon as Halloween decorations are taken off store shelves and the Christmas stockings are hung by check out counters with care, I began looking for one of my favorite catalogues. It's called Chinaberry and it is chock full of books for children of all ages. I love reading the descriptions of books almost as much as I like going to Barnes and Noble and actually touching the books and looking at the pictures. Any time of year is a good time for the Chinaberry catalog and a cup of tea, but it's especially good right before Christmas because it is chock full of new holiday books. It's hard to imagine that one can hear the story of the Nativity from so many different voices and still have it end with the glorious sound of angels singing and a tiny baby asleep in a manger. For me, it's a story that just never gets old. Whether you believe in the incarnation or not, when you hear the story of that young girl don't you want to ask, how did she do it? Were the girls made of heartier stock back then? Was her courage divinely inspired? Or did she just do what other women do when they find they are "great with child," let nature (God) take it's course? It might seem that I've got way too many questions and obviously a bit too much time on my hands. Sometimes I just can't help it, my thoughts take on a life of their own. Every year as I try to imagine those first few hours in the donkey-smelling stable I wonder how Mary and Joseph coped without their family and friends there to help. No ultrasound machines, no lamaze coaching, no soon-to-be grandparents with a video camera to record it all. Just a tired couple bringing a new life into a world gone crazy. Not so unlike some couples that today find themselves in the similar circumstances. These were the thoughts running through my head, when I had a clear vision of a baby shower in honor of the Holy Family. The people of my church picked up the idea ball and ran with it. We collected baby clothes and diapers and blankets and hats and food which we gave to a downtown mission church. We celebrated Eucharist in front of a handmade nativity scene. We had harp music and ate Middle Eastern food. With just a bit of pride,I have to say, it was one of my best ideas yet. It was creative, charitable and fun! I can't help but think a myriad of centuries after the fact, the young mother smiled. I've been reading an interesting book. It's the follow on to a book by Joan Anderson who took a year's personal sabbatical near a New England seaside. Sabbatical might not be the right word since it implies a thought process, and some planning. Anderson, I believe, just sort of decided one day she was leaving everything she knew behind and went looking for herself. As a woman who has been on that same kind of search for as long as I can remember the orginal book was a tease. While I don't particularly want to leave my family, friends, pets, books, etc., behind, I often fantasize about having a beach house (or log cabin in the woods) to run to on any given day for an indefinite length of time. "I've gone to the beach" the note I leave on the refrigerator might say. And after a while everyone who knows me would also know that I could be gone for an hour or a week, but when I got back I'd be a happier person. Well, maybe not necessarily happier, but more rested, more in touch. I was pleased to discover that after Anderson's year by the shore, she's written several books on the same theme. The one I'm reading now is called "A Weekend to Change Your Life." It's about the weekend retreats she's been facillitating for women all over the country. Women who are tired, burned out, full to their eyeballs in doing for others, etc, etc., etc. I'm intrigued by the idea of a retreat. I wonder, would I use the two days digging into my psyche and trying to cram all the personal insights into a place in my already jam-packed brain so they stick with me the way my "character defects" always do? Would I even have any personal insights? Would I sleep the whole time? Would the silence wear on my nerves? Would I watch the clock and wonder what's happening at home, did they remember to defrost the meat in time for dinner? Would I care if they didn't? Anderson talks of "Turning up the Silence and Turning off the Voices" (pg93). I can't speak for others, but I think that would be hard for me. Sometimes I talk just to hear my own voice, or sing for the fun of it, or cry or laugh, or turn on the radio, just to fill in the what Simon and Garfunkle must have meant when they sang about the sounds of silence. But isn't that what a retreat is all about? Doing something different. Listening for new sounds? Whispers that might have been drowned out by the white noise of every day life. Anderson also writes of getting physical. 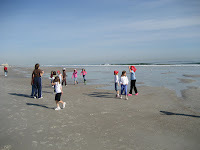 She has her retreaters go on a five mile hike across a sandy beach. Five miles! Well, there goes my idea of a good retreat! But I have to admit there is a tiny part of me that is kind of, sort of, intrigued by the idea. I love to walk on the beach, digging my feet into the coolish sand, looking for connections between me and my astrological sign (Pisces)sisters, listening to the sound of the ocean until gradually my heart beat and the waves are in sync. I realize that after you get in the groove, five miles might just be a cake walk. But it's the getting in the groove that I worry about. I have never really considered myself a nature girl. My experience at Girl Scout Camp when I was 11 years set me straight on that point. Yet, sometimes, I think one of my hidden personalities (and I have several) might be an Indian princess. She loves getting the Fall LLBean catalog and turns down page after page of clothing that could only be worn on a cold winter's day in some woodsy landscape. She loves listening to the sound of the birds singing their various songs, and even if she can't distinguish a cardinal from a whooping crane, the bird tunes make her smile. She loves getting her feet dirty, walking through piles of multi-colored leaves. She thinks the sound of wind through the trees at night is as good as any lullaby. When one gets alone and silent and physical at the same time, does one automatically starting thinking deep thoughts? One of the things about the kind of retreat Anderson talks about that worries me is the way all her retreaters have these metaphoric ephiphanies. One lady picked up some seaweed on the beach and carried it along behind her until she was ready to "let go" - an obvious reminder that her life needed to be pared down some. Others looked at sea shells, some rough and some worn smooth by the sea, and caught glimpses of their own strength or lack thereof. I'm pretty sure that when I see a shell, I see a shell and not much else. When I see the limp form of a jelly fish lying on the beach, I think to myself, better not step on it - not that the long stingy tenacles are symbols of the things in my life that are keeping me tied down. Here are some of what Anderson calls her lifelines for change - take action ... have an adventure ... face your fear ... seize the moment... tolerate isolation ... reach beyond your grasp. (p 112). All grouped together like that they sound kind of scary, but one at a time, any of them might be kind of interesting, if not fun. I often recall a story from my childhood. It's the tale of Brer Rabbit and Brer Fox who are sort of the Southern version of Roadrunner and Coyote. Brer Rabbit is always tormenting Brer Fox, and Brer Fox is always looking for a way to get even. In one particular story, the fox has ingeniously entangled the rabbit in a ball of tar. Quite pleased with himself, Brer Fox spends a little too much time devising ways to get rid of the rabbit once and for all. "Drown me! Roast me! Hang me! Do whatever you please," said Brer Rabbit. "Only please, Brer Fox, please don't throw me into the briar patch." And that, of course, was what the fox did, thinking the rabbit would be torn to shreds. Alas, the briar patch was the exact place the Rabbit WANTED to be, as it was his home and he knew just how to survive amongst the brambles. Brer Fox was foiled again. As I look at the things on my "To Do" list, and see the new year's calendar already filling up with doctor's appointments, school classes, and church meetings, I can't help but think ... Retreat? Why Brer Fox, you can just throw me in that briar patch! What is it they say about the best laid plans? Obviously my decision to post some meaningful bit of prose every day, has not quite turned out the way I had hoped it would. I'd like to say I have a good excuse, but would I just be making excuses to myself? It doesn't say so in my blog profile, but I am my Dad's fulltime caregiver. It's a strangely rewarding job, yet at the same time occasionally fraught with friction and generational dysfunction. If I were better about journaling and there weren't so many other baby boomers in the same place - sandwiched between caring for their children, grandchildren and parents - the story of our life together could make for a good book, followed by the movie version, starring Meryl Streep as ME and a "Grumpy-Old-Man-esque" actor as the loveable curmudgeon. Since he was drenched in sweat and his heart was dancing to an unknown drummer, we opted for an early morning drive to the ER. There was not much traffic on the way there or when we got to the hospital. To make a long story short, because it was blessedly uneventful, after several different samples of bodily fluids, a chest X-ray and an EKG, the Dr. admitted him for rest and tests. Which means, of course, she admitted me also. St. Luke's hospital is in partnership with the Mayo Clinic. As hospitals go, it is not too bad. In fact, it's really kind of nice. The Nutrition Department even boasts what it calls "Room Service," to deliver the notoriously-not-so-good-cardiac-diet. I really think, however, that someone should invent a better sleeping chair for the person who stays with the patient. I know, of course, that it is the patient whom the hospital staff is most interested in, but if they go to the trouble of putting a recliner in the room, couldn't they take it a couple of steps further and make it actually reclinable, comfortable AND somewhat easy to use? After a night in said chair that needed the World's Strongest Man to get it to recline, which wasn't really so bad once it was in the prone position, I needed to stretch my legs a bit. So while Dad was having a stress test, I wandered outside to look at the geese (or what I thought were geese but now figure they are really just big ducks) who have taken up residence in the pond in front of the hospital. 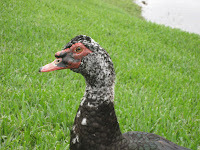 It was kind of fun to sit in the grass and talk to these funny looking, red-faced fowl, one of which seemed particularly okay with having his picture taken. On my way back to Dad's room, I picked up a copy of the Smithsonian Magazine from the waiting room. Having just conversed with geese, I thought it sort of omen-ish, that there was an article about the birds in the first magazine I picked up. I don't usually read the Smithsonian - it's kind of high-brow for me. But I took it back to the room, fought the chair into submission and began to read about the author's experience raising geese. The article was full of words like anthropormorphism, precocial(covered with soft feathers and capable of moving about when hatched), and gozzard (one who takes care of geese) and references to a well-known, and oft referred to as the best goose article around, by E.B. White of Charlotte's Web fame. The author, novelist Paul Theroux, didn't much care for, or agree with, White's article, The Geese. It seems Theroux believes geese should be geese and not cute white animals with human characteristics. Theroux also paints a rather sad picture of old ganders, who have lost their position in the gaggle. "Only after numerous losing battles do they cease to compete." It's at this point in an old bird's life that the "ganders pair up and ramble around together at the back of the flock - usually protecting each other." For some reason this made me think of the group of retired co-workers my Dad has lunch with once a month. All in various stages of "maturity," these men enjoy the commaraderie and regular opportunity to discuss news of their latest doctor's visits and the mess the younger generation is making of the world. I wonder if they were geese, would they be at the back of the flock ogling the pretty goose girls and trading remember-when stories? Perhaps, but that is way too anthropomorphic for me. Last night I awoke from a rather peculiar dream. But that's not really so strange. I think if there was ever a weird dream contest I could probably win it - or at least be a top contender. Take for instance the dream I had a couple of nights ago. I can't recall the whole thing, but what I do remember, clear as the proverbial bell, is that I had this pink-colored,coral reef-shaped growth between the toes on my right foot. I tried to explain it to Jack and my best description was that it looked like red play dough that had been squeezed through a garlic press. If you've ever done that, then you know you get these stringy, wormy threads that you can turn into hair for your play dough people creations. If you can, imagine one of these wormy globs resting between my toes. In the world of dream interpretation, I doubt this subject has ever come up. I'd had a rather bland dinner of potato soup, the night before, so I don't think the dream was gastric related. I also don't think even Sigmund Freud could come up with a sexual explanation for this kind of weird dreaming. Sometimes, I just have to believe that the inner workings of my mind is like one of those kid gyms at the Burger King - all sorts of ups and downs and tunnels and nooks and crannies -lots of places for ideas and thoughts and dreams to take root then go sliding down a ladder. Well my dream last night was less intense and I think I can explain some of it. For some reason I was walking along a path that had dense trees on one side of it and a fence on the other. I had taken a broom to sweep off part of the path, though I'm not sure why I felt it was necessary. Anyway, as I was walking along I noticed a brownish dog/pig looking creature lying on it's side in the woods. Clearly it was "great with child(ren)" and clearly it wanted to be left alone. Next I spied a snowy owl in the trees. Thinking that was pretty remarkable and wishing I had my new Canon elph camera, I came upon another owl - a mama feeding three baby owls. This sighting spurred me on so I hurried back to wherever it was I came from to look for my camera because it has this cool macro feature and I figured I'd get a terrific shot of the baby owls without having to get so close that the mama owl attacked me. I have no idea what this dream might tell you about my night time psyche, but I'm pretty sure my dinnertime conversation about German Shepherd puppies prompted at least part of it. And I'm very excited about my new camera and it's range of possibilities, so dreaming about it must just be a manifestation of my desire to find the photo opportunity in ordinary moments. In regards to seeing baby owls being fed, that's clearly an item for the "Things that moved me" list. As far as my dreams are concerned, I think I have to go along with Ashleigh Brilliant (how great a name is that - Ashleigh Brilliant? I think I might just change my name to Mary Brilliant - what do you think?) who said, "The best reason for having dreams is that in dreams no reasons are necessary." On that note, my coral-encrusted toes,Canon camera and I are ready to start a new day. Have a great one, and don't forget to look for a miracle(s). Second time is the charm? Last night I sat in this very spot and wrote my first post. I did what journaling experts say to do ... just start writing and see where you go. It was a fairly good piece of prose if I do say so myself. Short to the point, yet profound and witty. But just to check myself, I decided to "preview" this literary accomplishment and within minutes I'd pushed a button that, in the blink of an eye (or touch of a finger, as the case may be) erased everything that had taken me about an hour to write. Needless to say I was a litle peaved. I pushed every back button I could think of that might produce a screen with my words on its face. All to no avail. I guess when the warning came up that said something like, "hey, you haven't saved anything are you sure you want to do this?" it meant it saved as in, SAVE or you're going to lose everything. Finally, I gave up and went to bed, wondering if I was meant to be a blogger. I confess when I turned the computer on this morning, I said a little wishful prayer that the God of lost drafts would have found my posting and left it on my screen to await my final edit. Ah, well, que cera cera. So now, after that introduction, you might be wondering, what in the world I wrote about that was so important. At this point I guess I should make abother confession. I have the memory span of a tsetse fly. When I write, I give it my all, but as soon as the words on out of my head and on the paper they are often gone from my memory as well. I know, however, that my topic was New Year's resolutions and how frought with disappointment they can be. ALthough the idea is a good one - wipe the slate of the old year clean, then write on it the changes you'd like to make in the days ahead. The trouble is once the holidays are over, the ornaments packed away and the tree is discarded out by the curb, life sort of goes back to the old routine. Change doesn't come easily for me. A list of resolutions, though good intentions, often turns out to be a reminder of things left undone and more failure than success. SO this year I've decided to be proactive about keeping up to date my list of "Things That Move Me. "* It's a great way to keep your eyes opened for daily little happinesses and miracles. And at the end of the year, you have this neat list to remind you that all has not been ho-hum and routine. You have something tangible to warm your heart when the winter winds and holiday harriedness sets in. But mostly you have a list of blessings to remind you to be grateful. Here goes, I'm pushing the save button. Any mistakes may have to be overlooked. *This idea is not an original one. I give total credit to my daughter Wendy for coming up with the concept and for sharing it. It's one of her holiday tradtions, that I, in a grinchlike fashion but for only good reasons, stole and kept for my own.